I was drawn to this quote because of a conversation I had with my daughter recently. Her younger sister was pushing all of her buttons until finally my daughter snapped. I sent her to her room and after dealing with baby sister, I went to speak with my big sister. Her response? "Mom, sometimes she just makes it so hard to love her." Yeah. I think we all can relate. And let me be frank, I know at times I'm near impossible to love! And my girl's honest response allowed me to talk about God's love. 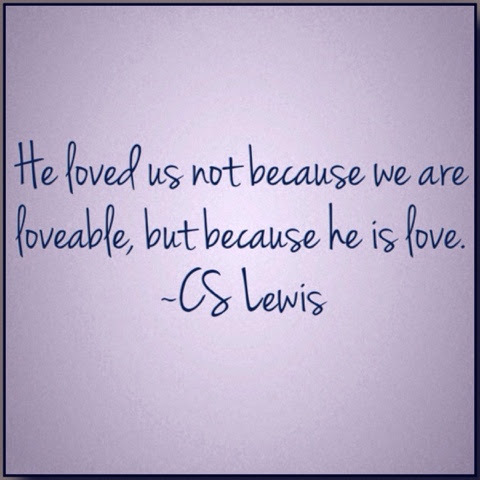 About how he calls us to love...always. Seems near impossible sometimes--just like she'd noted. But when we think about how God loves us, and that through him we possess that same ability, how can we do any less? Sure. We might need to send ourselves to our rooms first for a breather (and sometimes we need to stay there and love from a distance), but then we love.